In a large urban parish which I attended some years ago I have noticed that the liturgical life seems to be shrinking in both action and attitude. The priests no longer hear confessions before Sunday Mass. On minor federal holidays the two regular daily Masses are reduced to only one mid-morning when most working people cannot attend. Benediction after Stations of the Cross and the annual Corpus Christi procession have been dropped. Apparently it was too much trouble. I have noticed also that some of the priests and many of the adult altar servers do not to genuflect as they pass before the Blessed Sacrament before and after Mass. Little nods of the head seem to be the preferred reverence to the Real Presence of the Lord Jesus. Apparently it is too much trouble to genuflect. The priests say nothing about sloppy and improper dress at Mass, or non-stop talk before and sometimes during Mass. Nor do they have any comment when the adult altar servers approach the altar and open the tabernacle before Mass dressed in t-shirts and jeans, and treat the sacristy as their personal “man cave.” It seems to be too much trouble for the priests to correct them, if they even notice. This is not a plea for a sacrifice of the good for the perfect. Life is messy, and messiness is an apt description of humanity and the collection of sinners who make up the membership of the Catholic Church. Because of sin we too often make a mess of our worship. But we should never settle for a mess or become comfortable with one. We should never settle for less than the best in our worship and praise. Rather we should speak up if the clergy fail to safeguard the Sacred Liturgy from abuses and neglect. The Mass is not just a local, earthly social event, but a cosmic celebration and re-presentation of the events of our salvation. The almighty, eternal, and supreme being -he who is greater and more powerful than our intellect can ever fully grasp and he who owes us nothing!- extends his love to us in the person of his own incarnated son, Jesus Christ, with whom we are allowed not only to know and to touch, but to join in Holy Communion. As wonderful as this gift is, it is admittedly human nature to become lax and to fail to appreciate and give thanks. We all need regular correction. But while the laity can support the clergy in their efforts to correct the abuses and neglect that inevitably happens in our worship, as happens in all undertakings with human beings, it is they who control the pulpit, and it is they who must act. Indeed, the clergy, every priest and especially every bishop, are charged with the solemn duty to see that the Sacred Liturgy is celebrated in accordance with the mind and regulations of the Church, and the dignity and reverence of divine worship. That means that no priest has a license to improvise the liturgy in accord with his own personal specifications. It means as well that it is the duty of priests and bishops to demand worthy and appropriate conduct and attitudes from the faithful in their spiritual care. Some years ago a book was published called Fixing Broken Windows: Restoring Order and Reducing Crime in our Communities by George M. Kelling and Catherine M. Coles. The authors wrote that crime and disorder are closely, even inextricably, related. The appearance of graffiti, abandoned vehicles, illegal dumping, petty legal violations, and even broken windows is a sign of disorder. It conveys the clear message that no one is in charge, that nothing of importance is going on in that neighborhood. Nobody truly cares, and crime is acceptable. It is not that we (normally) have graffiti on the walls of our churches or even broken windows in our church buildings. But too often we have all the signs of liturgical disorder and neglect, clear signs that no one really cares about or even does not believe in what truly happens at the Mass. If the congregation comes late and leaves early…. If this is the reality then there is evidence of a deep disorder. It is a tangible sign that the pastor and his congregation do not care like they should care, and a clear message that the Sacred Liturgy in that place is not considered to be central to the life of that community of Catholic faithful. 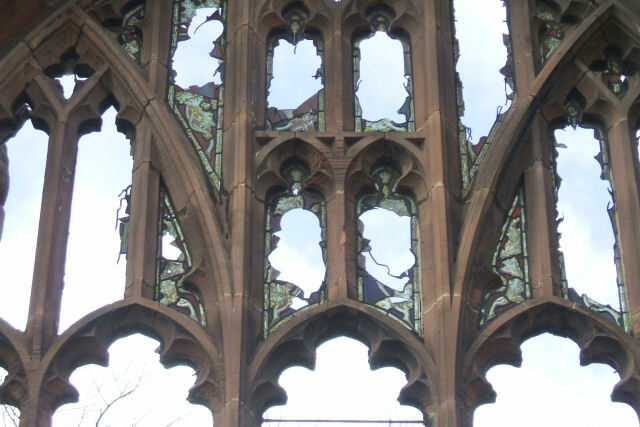 And then it is time to repair those broken liturgical windows!